Permanent Laser Hair Removal: Is it Right For You? Permanent Laser hair removal is an ideal way to put an end to shaving and waxing – but is it right for you? It largely depends upon your complexion and hair color. The ideal candidate for Permanent laser hair removal is a person with lighter skin and dark hair. The permanent hair removal lasers work by targeting the pigment within the hair follicles. Because darker hair has more pigment, the laser is better able to target this type of hair. 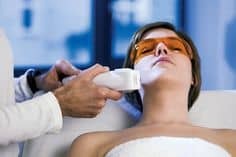 People with light blonde, white, grey, or red hair can still get permanent laser hair removal, but it is not as likely to be successful due to the lack of pigment in their hair follicles. Most people with brown or black hair can enjoy great success with permanent laser hair removal. If you are in doubt about whether your hair is dark enough to be successfully removed this way, speak to a professional to make sure. Even people with light brown hair may qualify. To learn more about this topic, visit Laser Hair Removal page in Wikipedia. Permanent Laser hair removal machines send a very hot laser light directly into each individual hair follicle. This pulsing light will move through the skin, causing no harm to the skin tissue, until it accesses the root follicle. Once the laser hits the hair follicle, it causes immediate damage. This damage stops the follicle from producing hair again in the future, or at the very least will greatly slow down the follicle’s ability to re-grow hair. The hair removal is typically done as an out-patient procedure, and it can take anywhere from a few minutes to an hour. During the procedure, both patient and technician will wear protective eyewear due to the brightness of the laser light. Most people experience little pain during the procedure, but feeling some warmth is common. To prevent discomfort, the doctor may administer a local anesthetic in the area where the Permanent laser hair removal is being performed, particularly if it is a very large area like the legs. Recovery is normally quite easy for most patients. Since the procedure is done on an out-patient basis, it can be scheduled into any normal day. Patients can go back to work or their usual routine immediately after their Permanent laser hair removal is completed. Most people have some redness in the treatment area, and a small amount of swelling may be noted. These effects generally resolve the same day of the treatment.